The workshop files, like the X Files but without the probing. Sockets and spanners. We all use them, yet there is more to sockets and spanners than meets the eye, common problems result in rounded bolt heads and lots of swearing. A bolt head’s corners are its weakest part, and yet many ‘economy’ spanners or sockets apply all the force through this small area, loose fitting tools make this problem much worse. 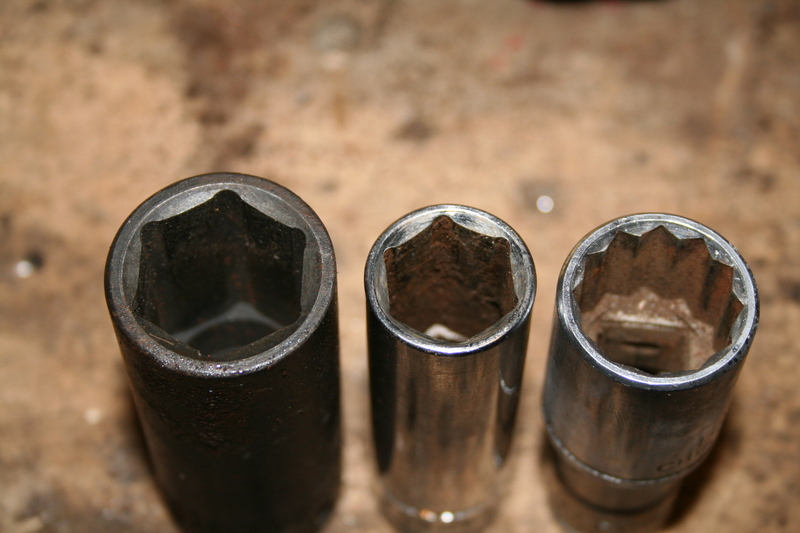 Good quality ring spanners and sockets have the corners radiused out so it is impossible to round the corners off the nut or bolt. This design has been taken a step further in recent years with spanners that have totally convex sides. A bi-hex tool has a 12 cornered pattern made from two hexagons superimposed and is easier to get on to a nut or bolt when there is a restricted access. The down side is that the force is concentrated closer to the corners, a single hex is generally stronger, and less likely to round off. Open ended spanners only apply force to two corners of the nut or bolt, so they should only be used for easy jobs. Modern ratchet spanners are amazingly strong and useful on those jobs where you would otherwise be moving a fraction of a turn at a time. When delving into the gloomy depths of a classic engine bay it is not always possible to get straight line access, luckily there are a range of universal joints available to save the day. The cheapest option is a simple Hooks type joint, but these can lock up at steep angles and can flop to one side when force is applied. There are also flexible drives based on contra wound springs, the thicker ones are less flexible but can take more force. The ‘wobble drive’ uses a profiled drive peg that allows the socket to tilt. Obviously the reduced metal on the drive means that it is not as strong, so it is wise not to use a breaker bar with them. Most wobble drives have a shoulder cut into the base of the drive peg so that the socket can be pushed a little further on to engage rigidly. Using an extension bar creates a force making the socket topple over. The way round this is to use an extension long enough so that you can support the shaft properly with your other hand and counter act the toppling force. And when pushing a tool with force always use gloves and an open hand to avoid smashing knuckles. Torque wrenches need to be accurate, the tolerance should be better than ±5%. Cheap torque wrenches that don’t have any such data available should be avoided. If you are just starting out in the wonderful world of mechanicking, use a torque wrench on every job until you get the feel of how much force to apply. Adjustable wrenches, hmm, what to write about them. generally the advice is avoid, get the right spanner instead,although a good quality item can get you out of trouble in an emergency. Every socket set should have a long ‘power bar’ also known as a ‘breaker bar’, this not only makes jobs easier but safer too. One of the big changes over the last two decades is in metal quality, years ago a bargain basement socket set would most likely fall apart the first time it was used in anger, but now even relatively cheap sets can be robust enough for home use. One thing to look for is the words Chrome Vanadium, or simply the letters CV. This is an alloy steel that combines hardness and strength, it has a bright silver finish just like stainless and needs no other surface treatment. Poor quality tools use ordinary steel and either polish it or plate it in chrome which can flake off causing nasty cuts. Conventional sockets and spanners are hard, and therefore brittle, to avoid deforming. But sometimes a stubborn bolt needs an extra whack to get moving, impact sockets are made from mild steel, so they wont shatter like conventional sockets when hit, but being softer it needs a much thicker wall to maintain strength. Impact sockets are usually etched matt black or painted, the raw steel would corrode and chrome plating would chip in the impact. There is more to doing up nuts and bolts than meets the eye. If the threads have corrosion then there will be much higher friction, so the bolt will be harder to do up and you might not get the correct clamping force. Most tightening torques are based on clean threads and sometimes with lubricant, but either way corroded threads need to be cleaned up or replaced. A lot of classics use bolts that are far to long for the job, the exposed thread will corrode and grind past the nut when undoing it, starting easily but getting tight again. So clean up and lubricate any exposed thread before attempting to undo it. Long cylinder head bolts in alloy blocks can seize at the bottom, allowing the bolt head to turn and spring back without coming loose. Penetrating oil may get past, so leave it to soak for a day or two, or leave a constant force on it for a long period of time by clamping the spanner in place. Sometimes the only option is to snap the head off and drill out the remains of the bolt. But beware of shards of sharp metal hurtling through the air. If the bolt just simply refuses to move at all it may be possible to shock it free by using an impact driver. Never hit a spanner, they are brittle and also have a tendency to ping off with painful results. Heat can come to the rescue too, or cause even greater chaos, be careful not to damage other components in the area or set fire to the car. Heating a nut causes it to expand and so loosen its grip, and conversely freezing the bolt makes it shrink away from the nut. 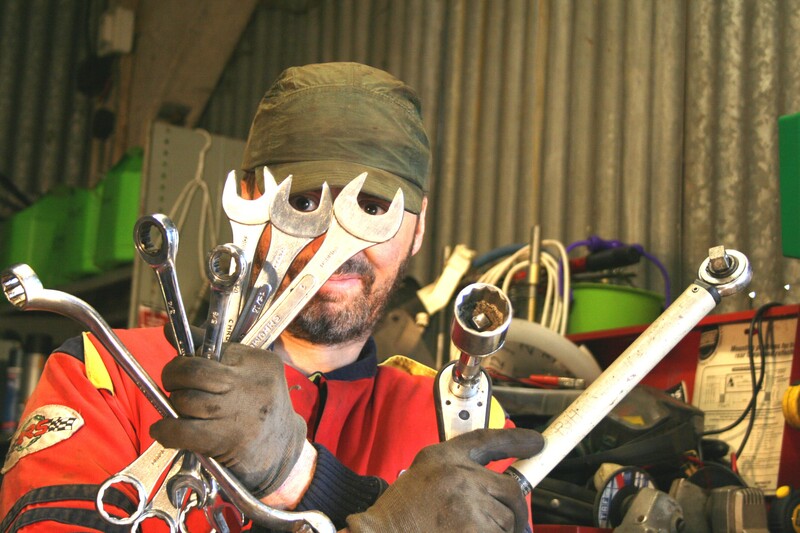 Every workshop needs a set of self gripping wrenches, aka pipe wrench or Stillson. As ever quality counts, the teeth need to be fairly fine and should be hardened or chrome vanadium. Cheap soft steel items slip making them useless. If it is difficult to get the tool started, hold the upper jaw on to the job whilst starting to apply load until it bites. Depending on how worn or corroded the nut is, it may be possible to use a slightly smaller socket to get it undone, mixing metric and imperial can sometimes do the trick, or force a smaller cheap mild steel socket on. The final option is to weld a piece of scrap metal on to form a leaver, but be careful not to accidentally weld the nut onto the bolt. Here is a good rule for you; if a job is very hard work then you are doing it wrong. If undoing a bolt results in you heaving as hard as possible on the spanner then you need a longer spanner. Get the right tools and learn how to use them, then life gets easier. Posted on May 1, 2011 Author RHCategories Technology Explained. Previous Previous post: End of the road for big engines? Next Next post: Testing Tyres – A Life on the Limit.